Switzerland is considered by many to be the most mountaneous country in Europe, it certainly has many of the highest peaks. Switzerland is land locked and situated quite some distance from the nearest seas, these facts coupled with its unique topography give Switzerland much more of a continental climate than its neighbours. Summer weather can be hot and sunny, winters can be very cold and snowy as a result. Although the spiritual roots of “modern” skiing are found in the 19th century in Norway, it was the British, who pioneered alpine sports. They arrived in the Alps in the 18th century and from 1850 to 1865, were the first to have climbed more than 30 Swiss mountain peaks. As for winter sports, Johannes Badrutt, owner of the Engadiner Kulm Hotel in St. Moritz, was a key figure. In 1864, he told his English summer guests that winter was even more beautiful and that he would pay for their lodging if they didn’t love it. Four aristocratic families came back for Christmas and luckily for Johannes, found the winter wonderful. As a result, the resort eventually welcomed more visitors in winter than in summer. Skibiking is not universally accepted in Switzerland so, much like anywhere else, it is best to make enquiries at the local tourist office first, before booking your accomodation, etc. Let's take a look at a round up of some of Switzerland's skibike friendly resorts. Bellwald is a well-known resort amongst the downhill mountain bike scene, where in the winter you can rent and ride Bullskate freestyle snowbikes. 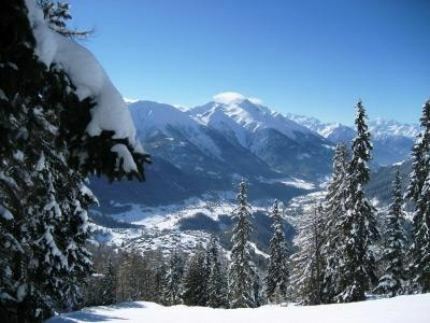 The resort extends from 1600 m up to 2560 m above sea level and offers over 31km of various slopes. Snow cannons ensure, snow security at Bellwald right up to the end of the season. Two chair lifts and two ski lifts provide uplift to panoramic pistes with a view towards the Matterhorn. Bellwald has a variety of slopes from difficult steep slopes, to broad carving slopes and gentle beginner hills. Davos is reported has to have allowed skibikes in the past, best check for an update to avoid disappointment on arrival. It has some of the longest and most varied skiing and snowboarding terrain in Switzerland; wide open cruising trails, steep narrow chutes and gullies, open powder fields, forests and well maintained half pipes and terrain parks. The Davos terrain is spread across five mountain areas and is accessible all on the one 'hands free' ski pass that also covers neighbouring Klosters. The mountain areas are supported by an excellent lift system and linked by efficient buses that operate five minutes apart throughout the day. Grindelwald is reported to have allowed skibikes in the past, best check for an update to avoid disappointment on arrival. For stunning views from your hotel window and from the slopes, there are few places to rival Grindelwald, and two of them are just over the hill. The village is nowhere near as special as Wengen or Mürren, but staying here does give you direct access to Grindelwald's own First area. But you can spend hours waiting for or sitting in the gondola or trains up into the Kleine Scheidegg area shared with Wengen Grindelwald regulars accept all this as part of the scene, and some elderly skiers even find it adds to the holiday by enforcing a slow pace. 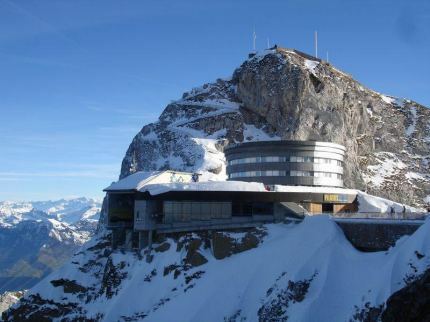 Sörenberg, is the biggest winter sports region in the Canton of Lucerne, boasting 17 chair and ski-lifts as well as mountain railways, where you can enjoy skibiking at altitudes of up to 2350m on the Brienzer Rothorn, the highest mountain in the canton. It is also the home of Swiss freestyle skibike manufacturer BullSkate and the site of what must be the largest freestyle skibike rental station in Europe, where after 15-30 minutes of instruction, novices can head up the mountain and start to hone their new found skills. Marbach is a small ski resort with just 4 ski lifts but it does boast a very impressive 715 metres (2347 feet) of vertical descent. Skibiker Michael Hoffmann reports that as of January 2012 skibikes are no longer allowed in Verbier which is a great shame. This most cosmopolitan resort of the Valais region is a huge winter playground, dominated by the spectacular panorama of the Combin mountains.